The Skellig Islands are off the west coast of Ireland. There are two islands about 7 miles off the west coast of Ireland called the Skellig Islands (Little Skellig and Skellig Michael). 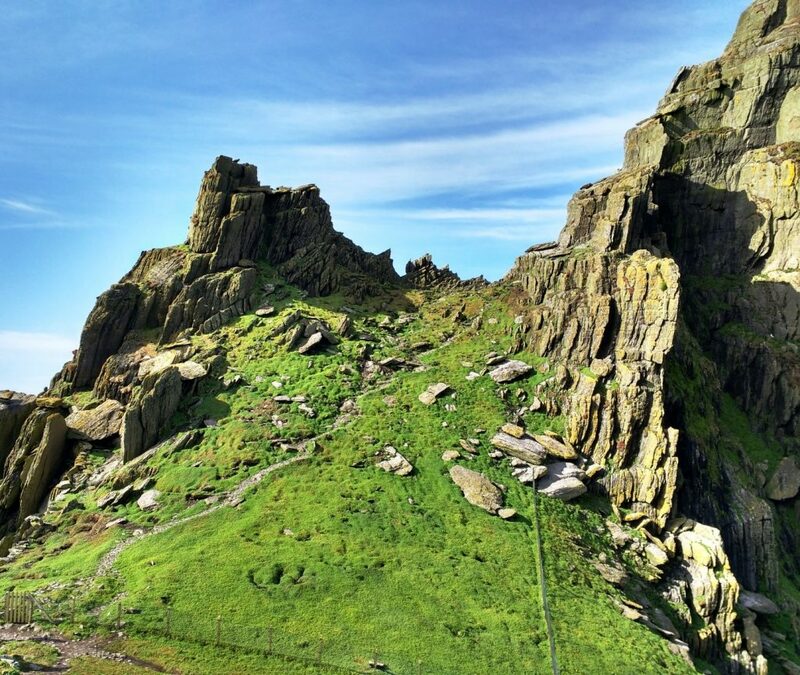 Many people know this location from the recent Star Wars movies, but the Skellig Islands were inhabited long before Luke Skywalker showed up! Most ads you see on this site are affiliate links. If you click through and make a purchase I’ll get a small commission and it won’t cost you any extra. So, thanks in advance for helping me keep bringing you the content you enjoy! Skellig Michael (Skellig in Irish means scraggly) is the larger of the two islands, and the only one open to the public. 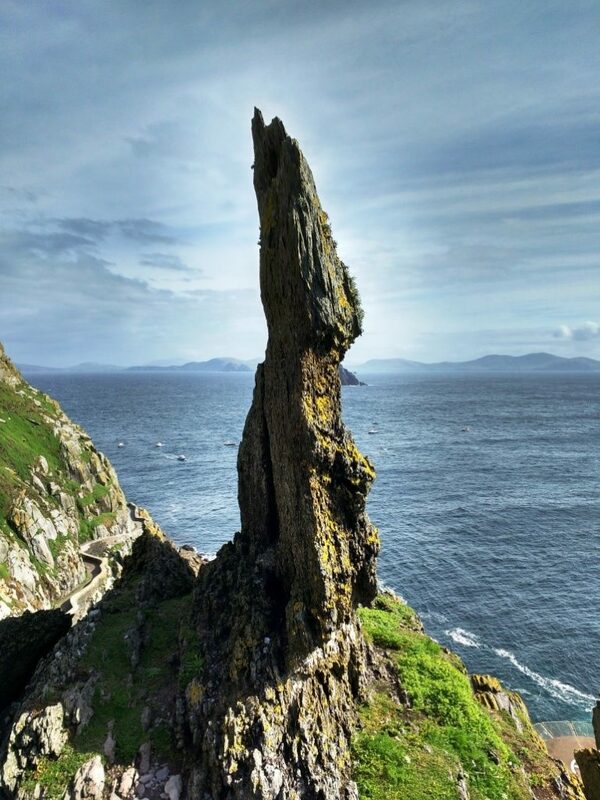 The smaller island, Little Skellig, is inhabited by several species of rare birds, and while not open to the public will be visible from your boat as you travel to and from Skellig Michael. 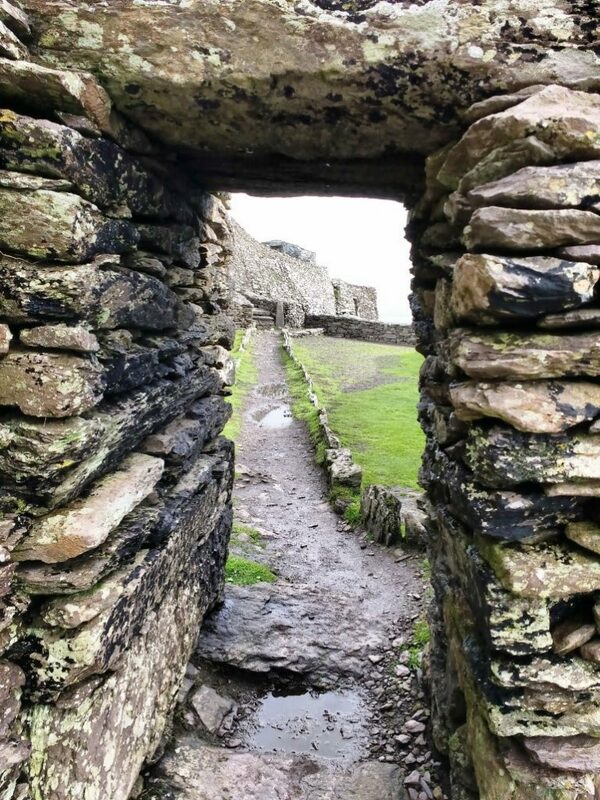 Skellig Michael’s history dates back to the 600s AD when it was first inhabited by Ascetic monks seeking to be closer to God. 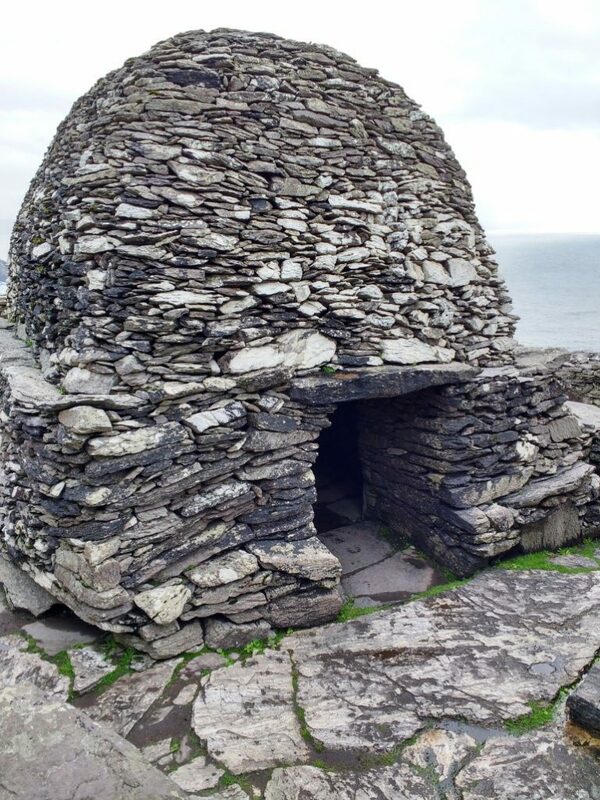 By about the 900s, these monks had built a monastery complex including two oratories, a later medieval church, a cemetery, crosses, cross-slabs, and six clochán-type domed beehive cells. 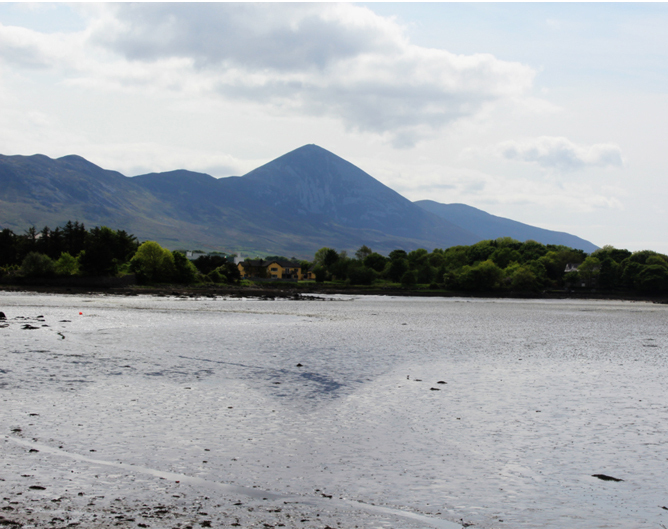 The island was inhabited until about 1300 AD when the monostatic monks returned to the mainland. 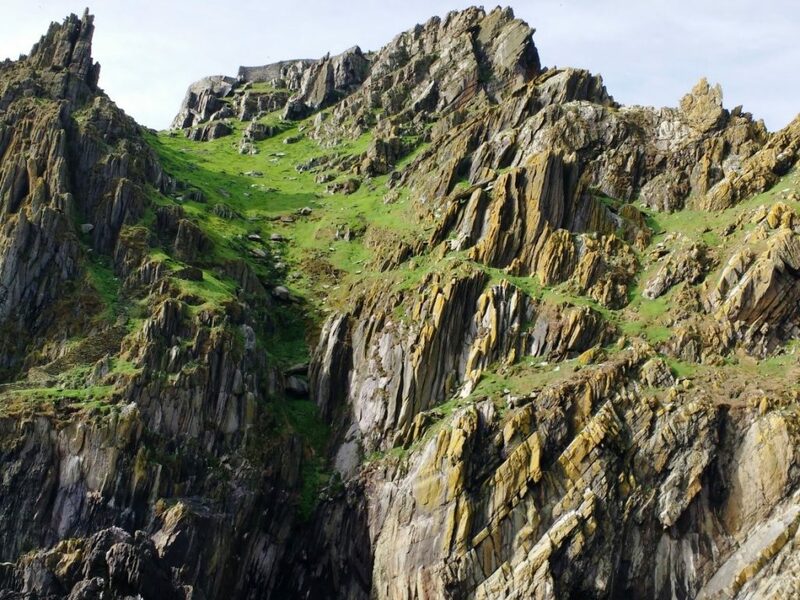 The Skellig Islands were inhabited long before Luke Skywalker showed up! 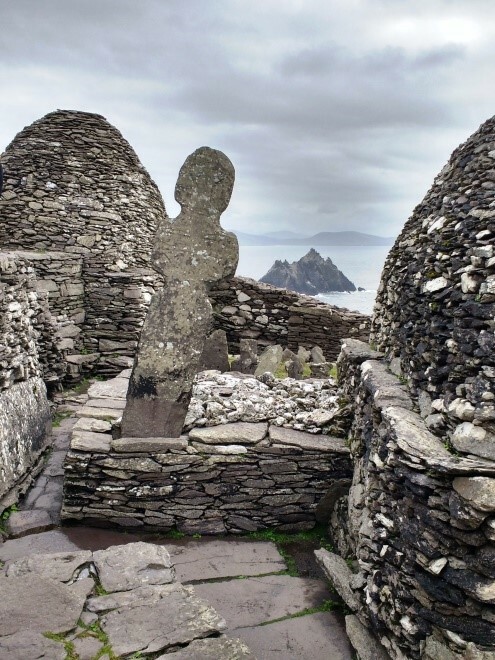 Skellig Michael is a UNESCO World Heritage Site. Because of this designation, only about 200 people a day are permitted to visit the island. Additionally, only certified ferry operators are allowed to deliver people to the island. 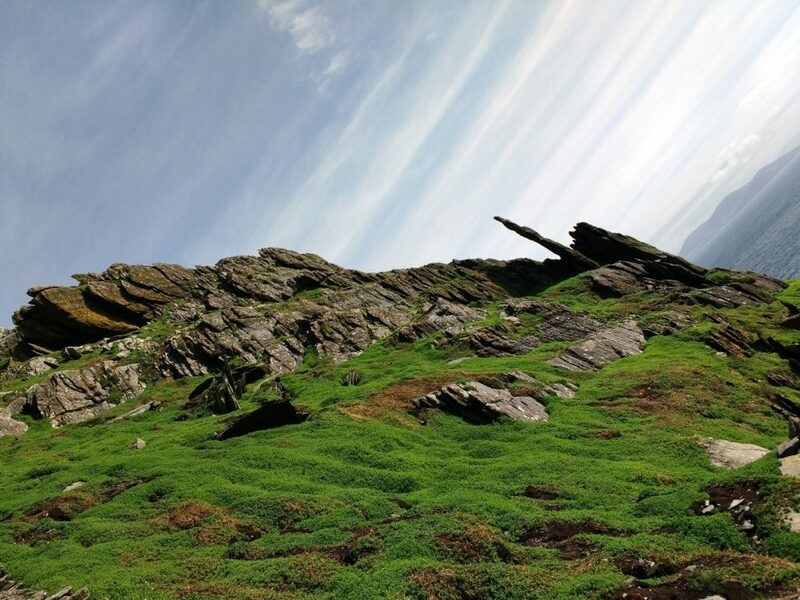 Consequently, you’ll want to plan your trip to Skellig well in advance to be sure you’re able to get tickets. Boats are only able to visit the island from about May to Sept, so if this is on your Itinerary plan around these dates. If you are interested in seeing the Atlantic Puffins that breed there, plan your trip for early in the summer. By late August the puffins have gone. Be persistent! Many tour operators have websites, but some only have emails, while others only take phone reservations. The tour operators that have websites fill up the fastest, so in order to get a spot, you may have to resort to emailing and calling these individual boat captains. 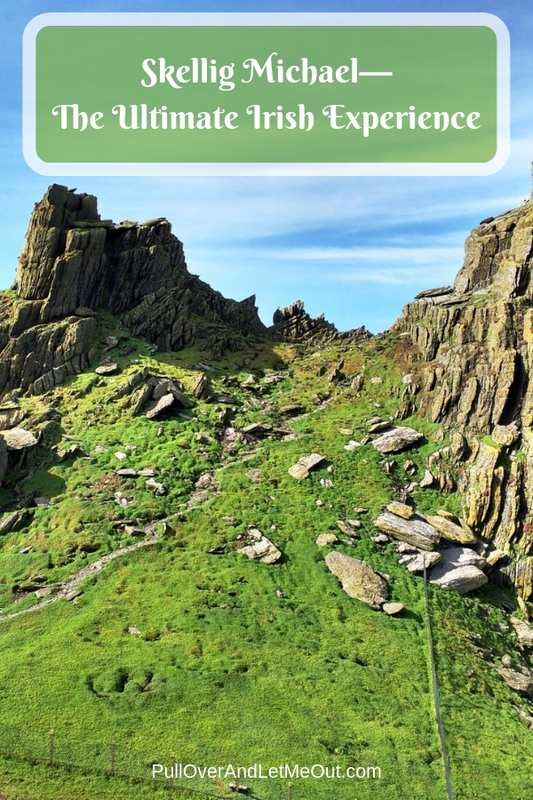 Pull Over Pro Tip: Skellig Michael is part of County Kerry. 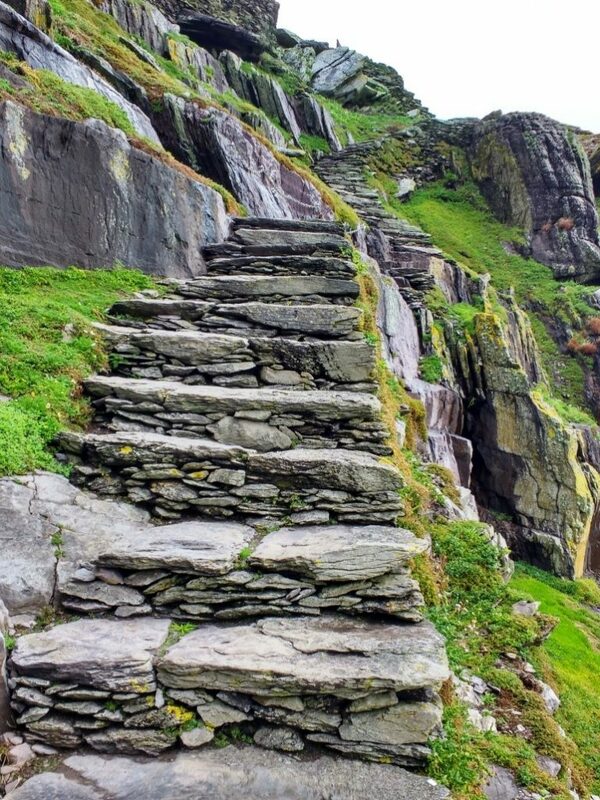 Trips to Skellig are conditional on weather, so it’s important to be flexible. Our tour operator required us to phone in the day before departure. During this conversation, we learned that we would be leaving an hour earlier, as well as from a different port an hour farther away. 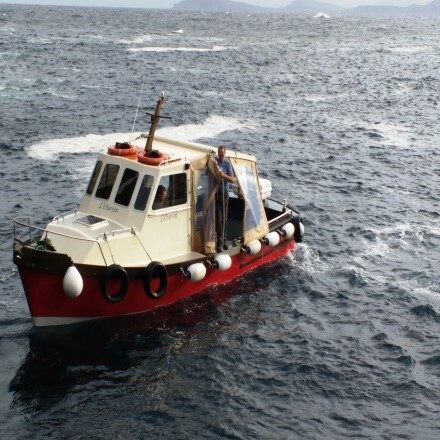 On average, only about 5 days a week can the boats get over to Skellig Michael. Both the days before and after our trip was canceled. 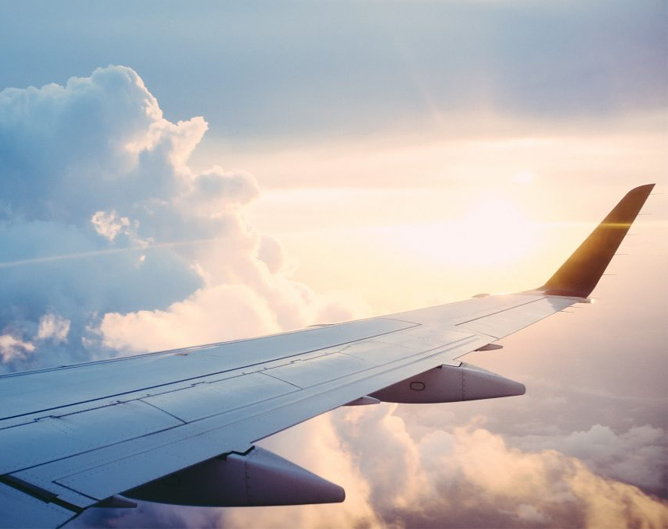 So make sure you have back up plans in case your trip is canceled. You will get your money back, but you probably won’t be able to book a different day. 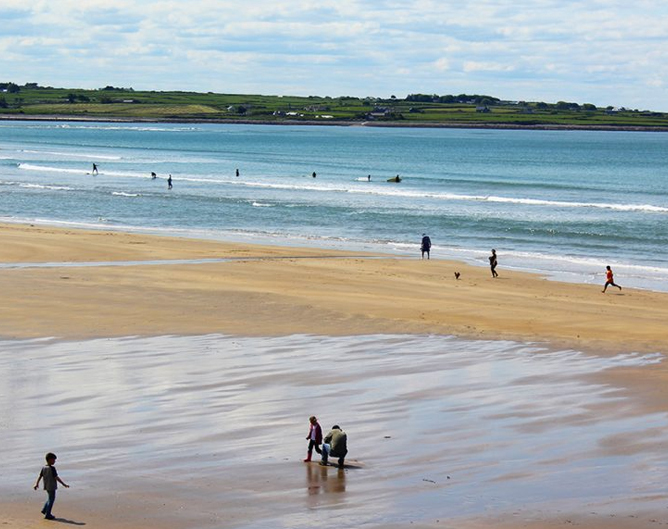 This part of the coast of Ireland is called the “Wild Atlantic Way” for a good reason!! 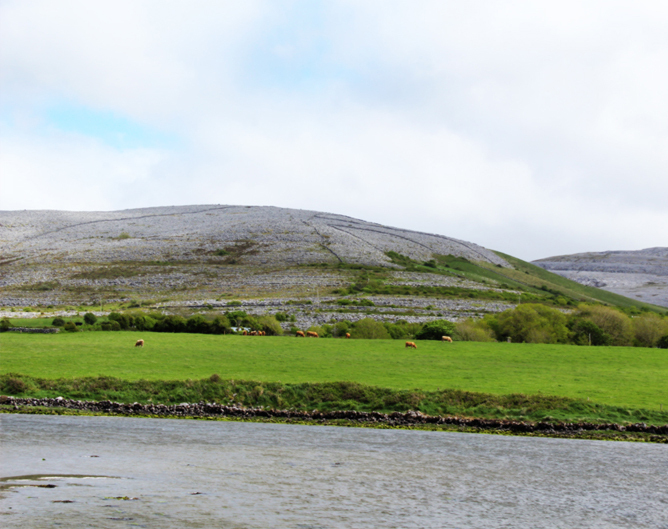 The trip to Skellig is a rough, long boat ride. If you suffer from seasickness come prepared with pills, patches, bracelets or whatever will get you over to the Island. The boats that take you to the island are small, ours only carrying 10 people. There are no bathrooms on the island, so keep that in mind as you make your plans for the day. There was a bathroom on our boat, but it would have been impossible to use it on the ride over!! Be on time, these boats wait for no one, so plan to arrive early. Our pier had a small café with breakfast items and bathrooms for people to use before heading out. There’s also no food or water available on the island, so take what you will need. You are not allowed to eat at the top of the island, so plan to eat on the boat ride over or back if possible. Dress appropriately! 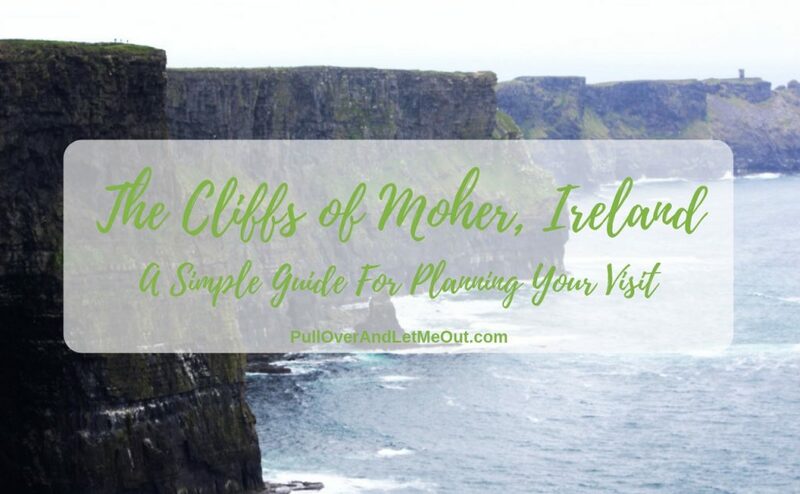 There are 600+ rock stairs up to the top that’s slippery when wet and there are no railings. Wear good shoes and dress in layers. Most importantly, be present while you’re there. Enjoy the scenery, listen to the talk the Park Ranger gives at the monastery and soak in the incredible raw beauty of this place. Don’t spend all your time snapping photos, but forgetting to actually see what you are looking at. 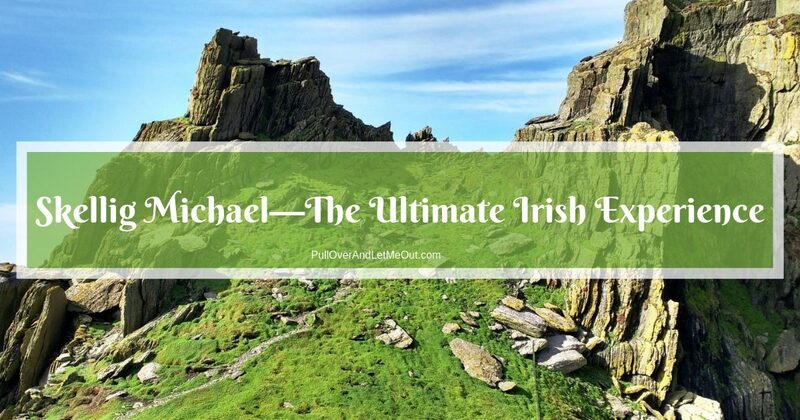 The beauty and history of Skellig Michael are unbelievable, so enjoy your trip!! Be present and enjoy your surroundings! IF YOU LIKE THIS, PIN IT FOR LATER! 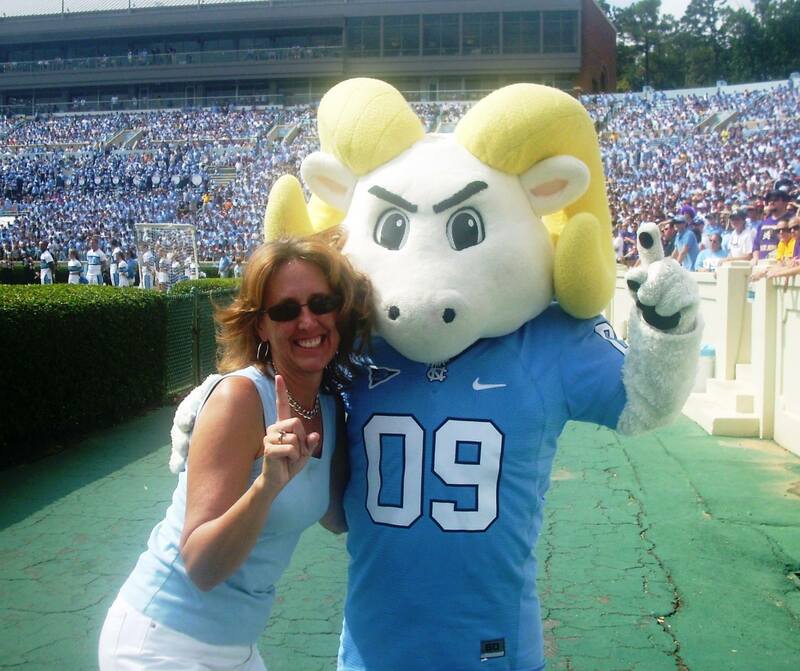 You may also enjoy reading this!